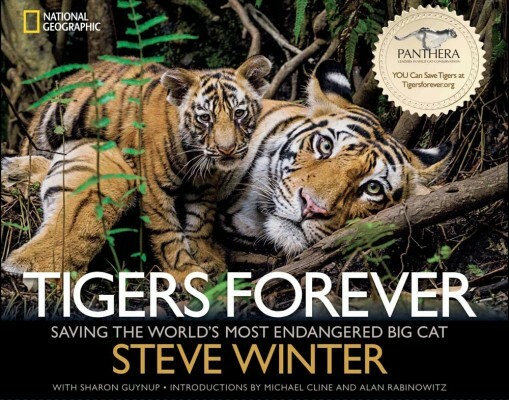 Steve Winter’s Tigers Forever Book is Available now! Every photographer has their photographer heroes. People we look up to because their pictures are amazing, or because they tell great stories with their images. Sometimes it’s because they are nice people, or because they want to change the world with their images. I have many photographer heroes, but one of them is very special because his goals are similar to mine. Steve Winter wants to make the world aware of the plight of big cats, he does so with stunning images that spread their conservation message. His use of camera traps is spectacular and his photo-journalistic style is exactly what is needed to tell these often sad yet potentially inspiring stories. I have had the pleasure of meeting Steve once. I helped him and his assistant with National Geographic camera traps for his upcoming story on Mountain Lions (you may have seen this video about getting the picture of a mountain lion with the Hollywood sign), up here in the Bay Area. He was kind to me and didn’t make me feel any less of a photographer. Even though he is of course a huge deal. A total class act, and I appreciated that immensely. I am telling you all this is because Steve is on the crusade again, this time fighting for Tigers. His new book Tigers Forever is available for purchase now. Go order a copy if you care about tigers or at the very least want to see amazing wildlife photography!